I’ve relaunched the website www.12stix.com, the site is perfect for tech, training or gaming related sponsored posts and text links. As an introductory offer links are available for £50/year. It's been almost five years since I last redesigned ImAFish, a lots changed in that time, the Internet has responsive design, I'm married and have a baby. ImAFish is still going strong but it was time for a refresh. The new ImAFish is responsive, a good proportion of our traffic is now from mobile & tablet devices so it made sense to target these. The sites backend is now Drupal 7, its not been an easy migration, even for a relatively basic Drupal 6 site however as we've previously upgraded from a Drupal 5 installation there was a lot of technical baggage. I've taken inspiration from a number of modern news sites including Medium and Quartz, the readabilty and simplicity of both these sites was a big factor in some of my decisions in the new ImAFish. The new design uses the Sculpt framework provided by Heart Internet. Responsive design is the idea that web site layouts should change based on the users choice of device. Depending on the users environment the design may adapt to the screen size, platform or orientation. I've put together an example that you can use in your own web sites. Look what happens when you resize the page horozontally in your web browser or on your mobile. Feel free to inspect with Firebug and copy into your own project where suitable. In the above example we are saying to include 1col.css when the media is a screen and the maximum width is 660px. Here we are saying to display 2col.css when the media is a screen, the minimum width is 1000 pixels and the max-width is 1200 pixels. Any questions I will try to answer in the comments. Update: When setting the viewport you might want to detect the device with PHP first otherwise the viewport will be set too small on the iPad. A Decade of Blogging - ImAFish's 10th Birthday!!! In June 2001 along with co-founders Ben Powell and James Vardill I was about to take my GCSE's. Exams that could potentially determine the course of my life however something else had taken my interest, something that ended up forming a major part of my career - web development. These early skills surrounding key web technologies such as HTML, CSS and PHP came at a time when we were using technologies such as Internet Explorer 5, Windows 2000 and Frontpage. 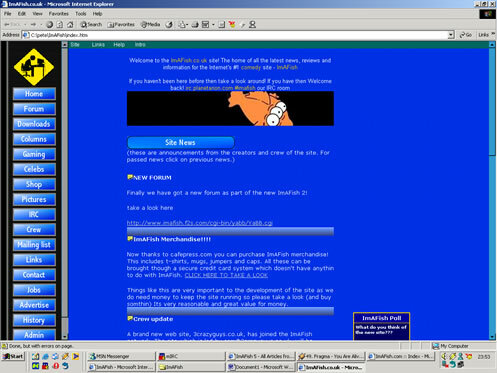 A time before today's niceties of Firefox, JQuery, OS X, Firebug and Drupal. I've worked on ImAFish through School, College, University and work, always looking to improve the design and write interesting/relevant content. Fast forward a decade and ImAFish has been visited almost a million times, had millions of page views, been featured on sites such as Digg, Life Hacker and This Is Money, had 10 major redesigns and a published book. ImAFish has reached a level of success that I never thought was possible. A big part of that success has been down to our loyal readers who I appreciate sticking with us over the years. Thank you to all the visitors and contributors over the past decade and I look forward to the next decade! In recent years the Iraqi economy has boomed, fueled by oil revenues and growing internal stability, the country is attracting huge amounts of investment from around the world. Beginning 2010 a news website was formed by two companies with vested interests in the region to cover business news and to change perceptions that Iraq was still a war torn country with little prospects. In June 2010 The Web Orchard took over web development of the site helping to take it from a simple news site with less than 9000 visitors per month to a journalism juggernaut with over 120,000 visitors per month. By using our experiences gained from other blogs including ImAFish we were able to implement features to encourage users to stay on the site and contribute to discussion. The latest development has been to include affiliate links to research reports in Iraq to help bolster revenue. By displaying targeted reports under posts we hope to keep the reader’s attention once they have finished the article. “Targeted content is essential to Internet advertising and is how companies such as Google have become so successful” commented Pete White. As well as website development scaling the infrastructure to deal with rapidly growing traffic has been important to maximise uptime and to keep the site loading quickly. Development in the site based on feedback from users is an on-going process and one embedded in the ethos of the work carried out by The Web Orchard. A big merry christmas to everyone, especially those who have checked out my latest book - the feedback has been amazingly positive and thousands of you have read it online! I've been busy updating my web portfolio over the past few days, you can check it out as part of our website specialising in Shrewsbury Web Design. Development on over 30 projects including content management systems, blogs, intranets, e-commerce sites and community sites. Disaster recovery at one of our key sites after an explosion in Shrewsbury in the opening days of the year. Taking an existing website from 300 visitors per day to over 3,000 (peaking at 10k)! Forming exciting new business partnerships with a number of companies. An overall 99.9% uptime on all systems and websites. 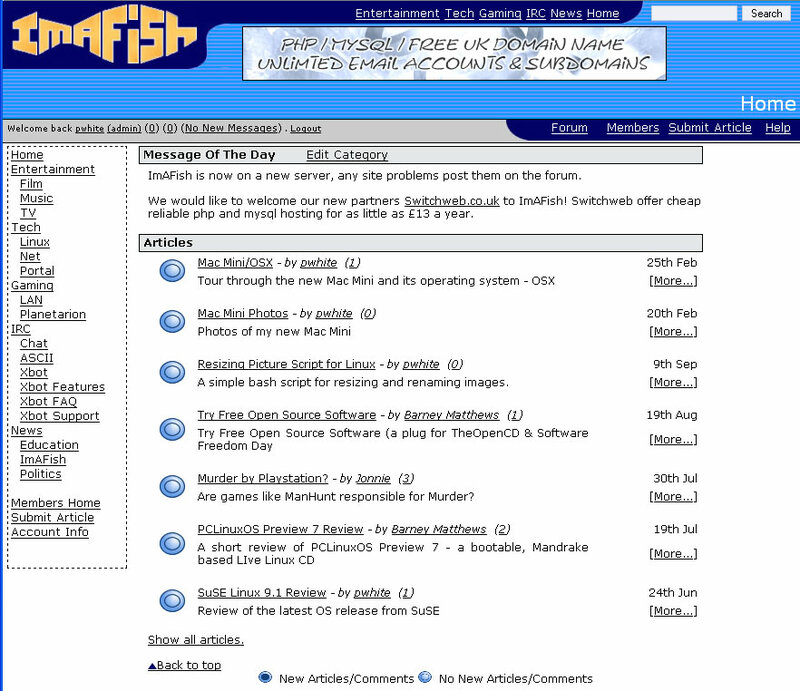 I look forward to taking ImAFish into 2011, our 10th year blogging! Photography from amazing new destinations including Dubai, Paris, Lyon, Edinburgh, Silverstone and Stratford Upon Avon making the book almost double the size of the first edition. More great commentry and facts. Travel Photography is priced at £29.96 and is the perfect gift for Christmas! Shrewsbury, UK based 'World Famous' ImAFish has celebrated its ninth birthday. With over 100,000 visitors and a book launch its been another record breaking year for the site. Founder and chief editor Pete White commented "I'm thrilled with ImAFish's progress over the past year and can't wait until our 10th birthday in 12 months time. Our network of sites have been doing well too with the relaunch of our Scary Video Clips and iPhone Videos sites and the brand new iMac History website. It was great to see our investment in the iPod History website pay off with the hugely successful sale back in November." ImAFish would like to thank everyone who has contributed and visited ImAFish in the past year and wishes them a warm welcome on their next return. It's been a great week for our first book Travel Photography with the local media going crazy over it! We've been featured in our local paper the Shropshire Star and on local news website Shropshire Live. Heres the story from the Shropshire Star. Read full story on Shropshire Live. Travel Photography is available in print (£12.95) or digital download (£5.95) from the ImAFish Shop!